I admit it. There's a kind of precision about audio/video components, home theater and sound reproduction that's downright addictive, similar to the appeal of other technical hobbies like cameras, cars, boats and aviation. They all have their own vocabulary and jargon, of course, and it's easy to get bogged down or enraged by it (when I start dreaming about pixel counts and aspect ratios, do I need help?). But lack of precision can be equally annoying. Sometimes, for instance, a vague statement about positioning Axiom QS8 or QS4 multipolar surrounds just isn't enough—“Oh, place them on the side walls above your ear level, and slightly to the rear of the listening area. . .” is just too unclear. 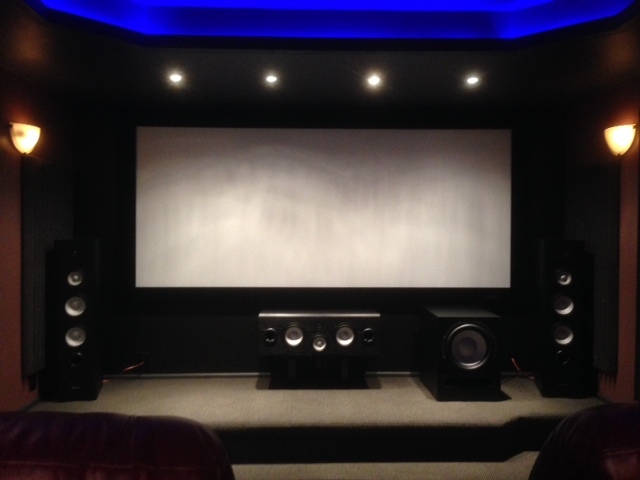 So, for all those newcomers to 5.1, 6.1 and 7.1 home theater setups, as well as seasoned enthusiasts who want precise directions, here they are, courtesy of Dolby Labs, the developers of Dolby Digital and its many variations. As you are reviewing the diagrams, remember that the goal of all speaker placement for movie soundtrack playback and multichannel music reproduction—even stereo—is a smooth, consistent and unbroken soundstage across the front, coupled with a sense of envelopment in the ambient surround effects. In other words, you're after a sense of location, whether that is suggested by what's on-screen, by the recording venue or even the dry, intimate acoustic of many pop/rock studio recordings. As you experiment with speaker locations, think back on a really great Dolby Digital movie presentation in a big cinema when you had a good seat in the central part of the auditorium. You are not constantly looking up at the surround speakers on the side walls or at the back of the theater. The same applies to a home installation. You don't want to “hear” the location of specific surround speakers or, for that matter, your main left and right front speakers. Involvement in the movie or music (whether multichannel or not), is everything . That is the goal. If a sound is “hard-mixed” on a recording or soundtrack to a particular spot at the side or rear, then it's OK for it to appear there (I'm thinking of an Aaron Neville multichannel recording where the backup chorus is hard-mixed to the right surround. . .which seems a bit odd, but you get used to it. Maybe the backup singers were in that spot in the studio.). In Dolby Digital 5.1 soundtracks, most movie dialog is hard-mixed to the center channel, and if you experiment with center speaker placement, the dialog should be one with the actors on the screen. It shouldn't seem detached from the screen. If it is, you have your center channel too far away from the screen. Let's deal with the “standard” Dolby Digital 5.1 setup first (fig.1) since it represents the mandatory standard for current DVDs and for High Definition TV broadcasts. (DTS, a competing system, is optional on DVDs. It does not have to be included.) Assuming you are centered in the middle of your couch, facing your TV display and center-channel speaker at 0 degrees, then your left and right main front speakers should be within a 22- to 30-degree angle to each side, viewed from your seat. Increasing numbers of movie soundtracks are encoded in Dolby Digital EX, which adds a sixth mono channel at the back. Although a mono channel, the back channel is better realized by using two rear speakers, at angles between 135 and 150 degrees to the front center (fig. 2). Directly behind you would be 180 degrees from the front center, and that isn't recommended because of how our ear/brain interprets sounds originating from directly behind us. We sometimes confuse such rear-emanating sounds and place them in front of us. This dual-rear arrangement also serves perfectly for Dolby Pro LogicIIx (7.1 channels), which synthesizes separate Left Back and Right Back signals (so does Harman/Lexicon's Logic7) for increased realism and more dramatic rear/front or front/rear flyover effects. DPLIIx also adds heightened spaciousness and realism to many 2-channel music sources (not all), by extracting natural ambience present in recordings and redirecting it to the side and rear surrounds, where it belongs. Incidentally, similar speaker placements apply to DTS 5.1 and its comparable variations, DTS ES and Neo:6. DTS is not a mandatory standard for DVD or HDTV, but it's enjoyable nonetheless, as is Logic7, Harman/Kardon's proprietary 7.1-channel setup, originally developed by Lexicon but also offered on H/K A/V receivers. For multipolar surrounds or direct-radiating speakers used as surround speakers, the same angles and placement suggestions apply. A few receivers have facilities for using two different types of surrounds (multipolar and direct-firing) and if you have that luxury, great. 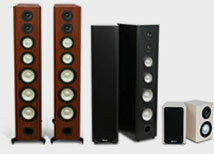 Likewise, there are some Axiom customers who have gone with floorstanding speakers—e.g. five M80ti's—all round. Although SACD or DVD-Audio recordings are mixed using direct-radiating speakers all around, Axiom's double-blind tests have shown that Quadpolar QS8 surrounds deliver a more generous listening area at different locations in the room. If you are in the "sweet spot," our double-blind tests also showed that listeners weren't able to discern any significant differences in multi-polar or direct-radiating surrounds with SACD or DVD Audio. 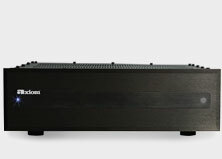 Since deep bass 80 Hz and below is non-directional, the subwoofer can go just about anywhere on the floor, but corners will give you the greatest enhancement of deep bass, at the risk of it sounding boomy. 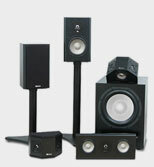 Moving a subwoofer or a floorstanding full-range speaker away from any intersecting room boundary will reduce the tendency to boom or to have too much bass. In either case, you will have to experiment to achieve smooth and extended deep bass in your preferred listening location. Bass output will vary in different spots in the room as a function of the room's dimensions, so aim for good bass extension in preferred seating locations. You can't satisfy everyone in the room, although adding a second subwoofer will help smooth out the bass for other listening locations. 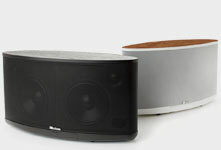 Look in the A/V Tips and Axiom Digital Library for more detail on subwoofer placement tricks.